Normally, I hate V-Day. Overrrrrrrrated. 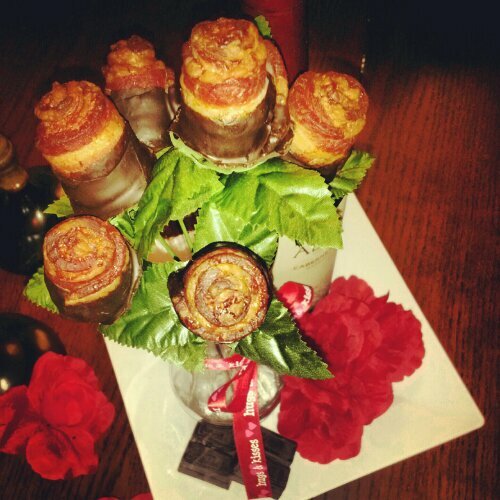 But, this year, my ManBacon introduced me to bacon roses, which is prolly the sweetest thing a significant other can do. I am fairly certain I could eat only chocolate bacon roses for the rest of my life. Helloooo delicious meal-on-a-fake-stem. 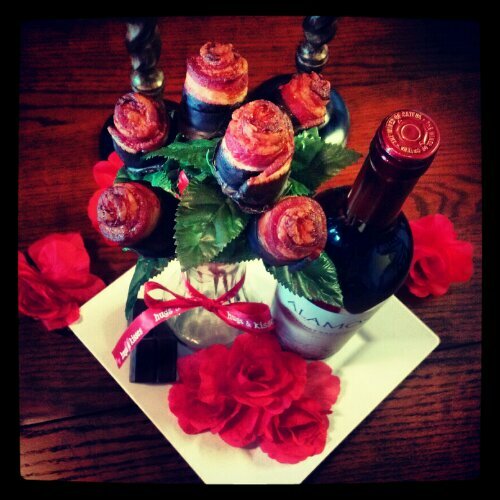 If V-day is an excuse to eat bacon roses, I’m all in. You should make them. For Valentine’s Day. Or any day. Even if you’re single. Seriously. You don’t have to dip these in chocolate. But I highly recommend it. 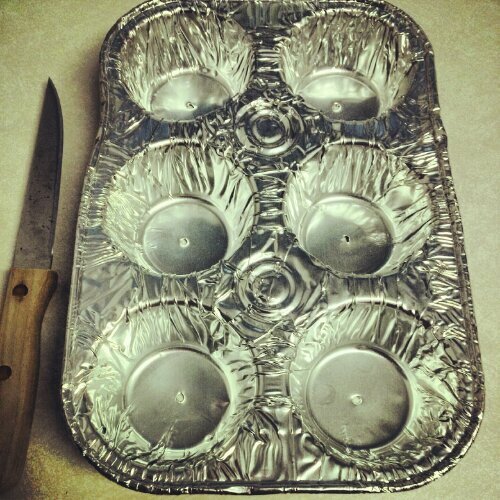 Poke holes in the disposable aluminium foil muffin tin with a knife. Tightly roll strips of bacon. 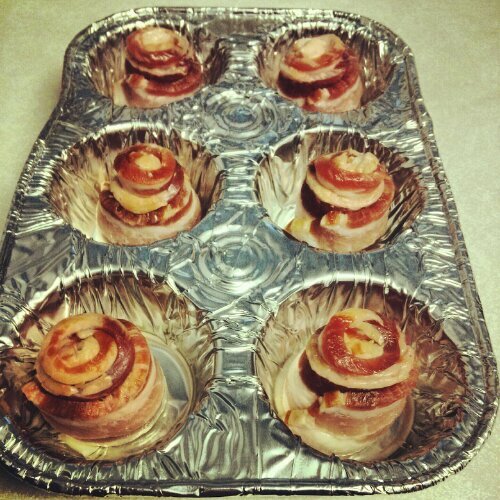 Place rolled bacon strips in disposable muffin tin, meatier side on top. Place disposable tin on a wire rack inside of another pan that’s been lined with aluminum foil. (If you don’t have a rack, find a container pan that the disposable tin can be suspended in so it’s not touching the bottom, if possible). Use a pan with an edge in case you get a lot of bacon grease run-off. Bake @ 375 for 30-40 minutes, or until bacon starts to brown and get crispy. 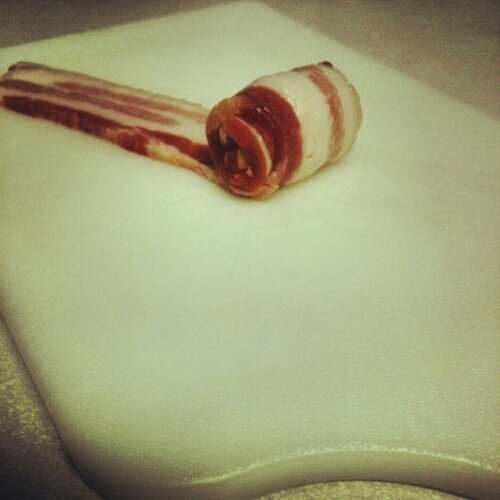 Remove bacon roses from pan, set on paper-towel lined plate. 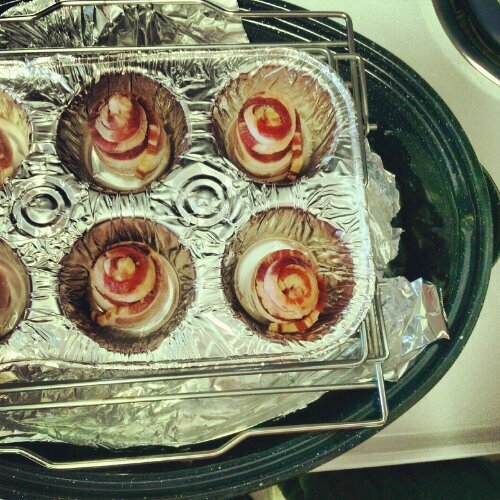 Set plate of bacon roses in freezer to cool, 10 minutes or just cooled. (but don’t freeze ’em! you can always put them in fridge instead). Melt chocolate and all other ingredients until smooth. Pour chocolate into coffee mug. Let cool a few minutes to thicken. Dip bottoms of roses in chocolate. Place on wax paper plate. Set plate freezer for 15-20 minutes to allow chocolate to harden. Poke a hole in the center of the bottom of the rose with a toothpick or knife. Pop fake flower heads off stems. Trim stems, if necessary. If you have a vase, stick the stem bunch in vase. If you have ribbon, make a lil bow. Stick bacon roses on stems. Wrap bacon around a scollop to make a rosette and bake as shown ,,, scollops are tender and delicious ,,, add chocolate to half the roses and scollops … not all people like chocolate on their bacon with scollops. I love them.